Rain today, after a nice spring weekend. 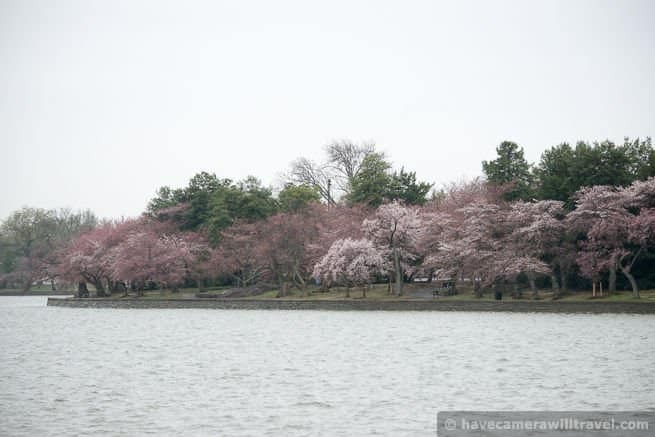 The rain is keeping the tour buses away this morning, so it's very peaceful around the Tidal Basin. It's a quiet, but damp, morning for the NPS rangers on site. More of the trees are out now, although they're still in a minority. 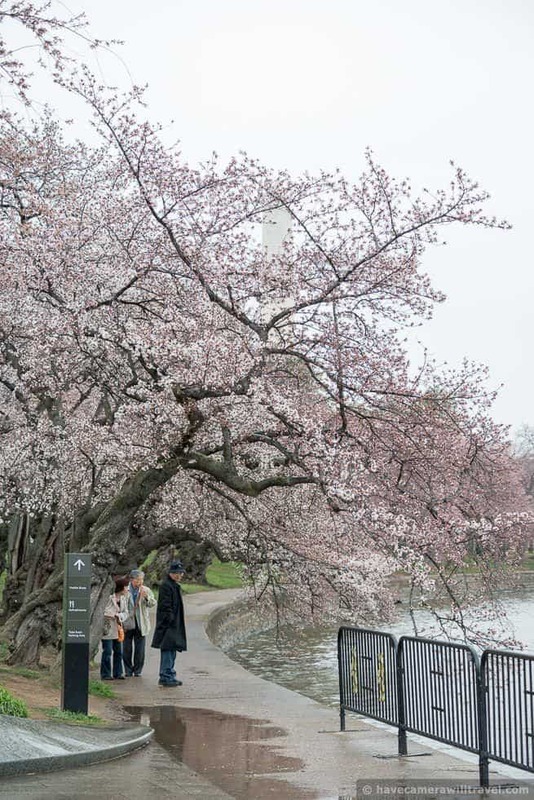 It's still several days away from full bloom, but if you brave the rain and head down today you'll be able to easily find some clusters of trees in bloom. It'll keep getting better every day for the next week or so. 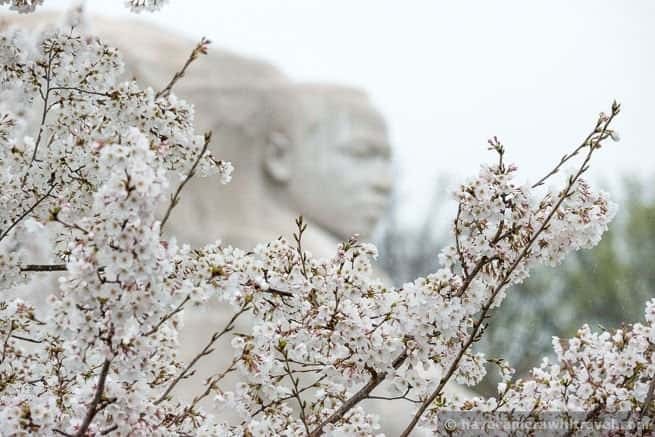 The National Park Service has decided that as of today (April 7) 70 percent of the blossoms have reached the "puffy white" stage. 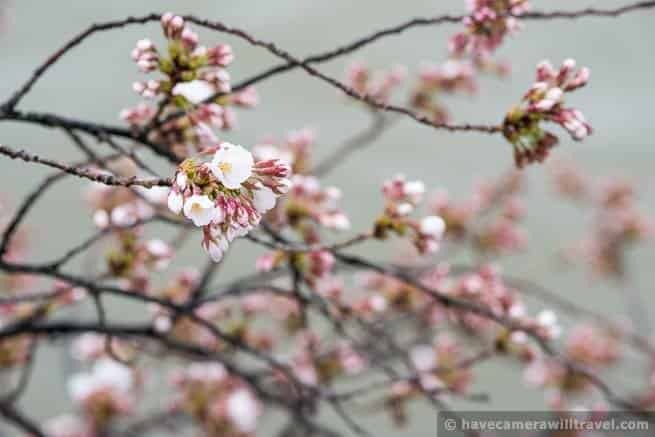 And while some trees are white with fully open blossoms, others are still lagging behind. 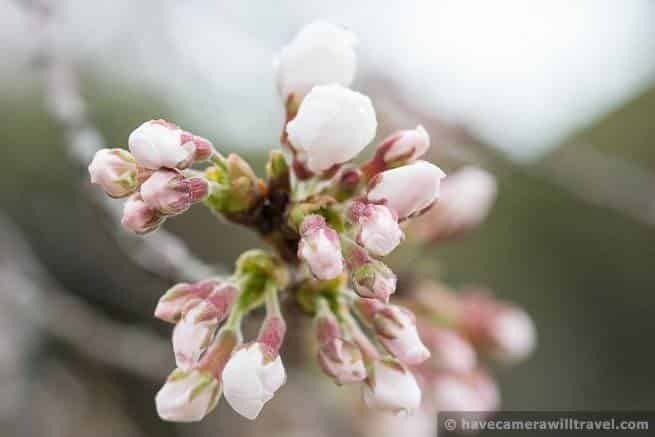 Typically the peak bloom date, when 70 percent of the blossoms are judged to be open, comes about 4-6 days after the puffy white date. 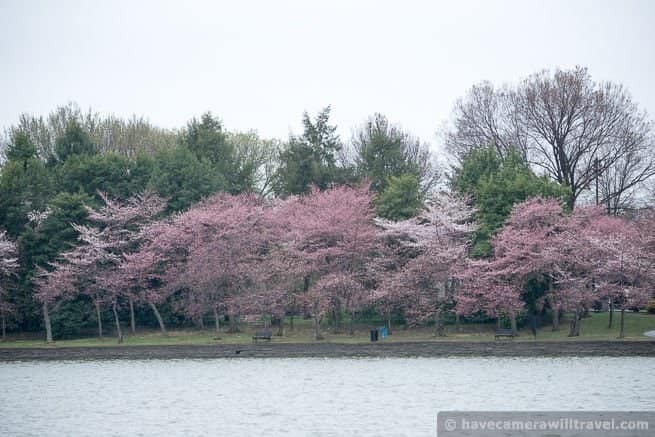 From a distance, the trees are mostly pink from closed (or partly closed) flower buds, with a few patches of white from the open blossoms. 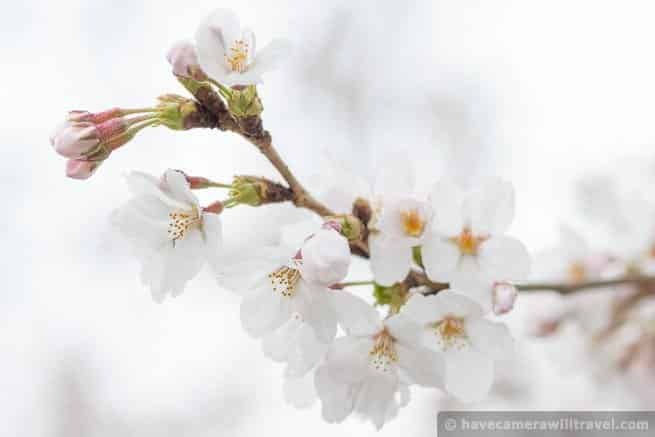 As the blossoms start to open, the white petals puff out and then open fully. 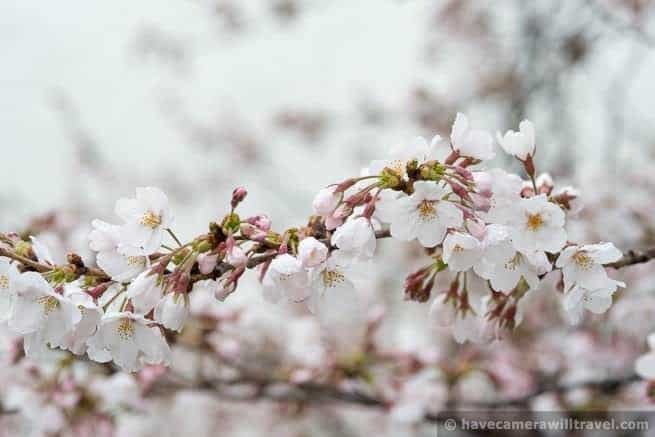 The petals start out bright white and gradually turn pink over several days, before dropping off and being replaced by green leaves. 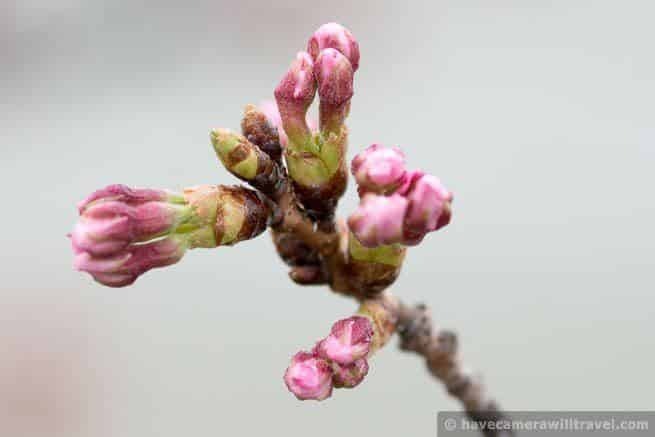 You can see the different stages of the blossoms opening in the photos below. All of these were taken this morning, which is a good illustration of how the pace of the bloom varies from tree to tree. If you're only able to get there on a weekend, this coming weekend (April 12-13) is likely to be prime viewing. Expect crowds. I am coming to DC on Thursday morning. 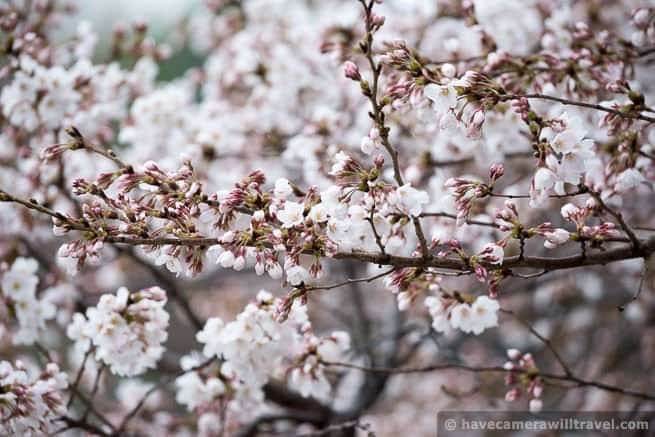 Do you think the blossoms will be near or at peak by then? 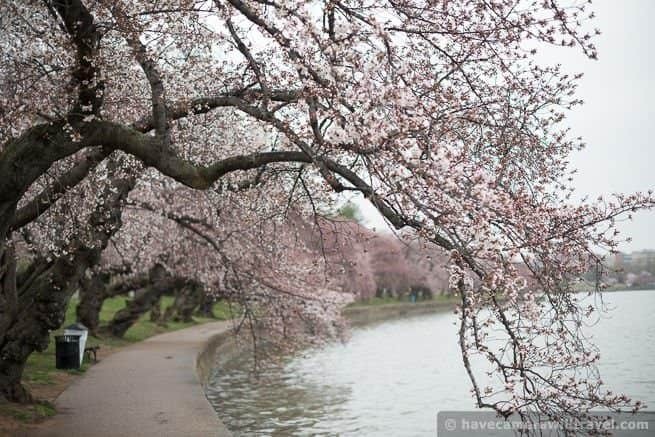 They'll still be a few days away from the technical peak bloom, but there'll be a lot of blossoms open. 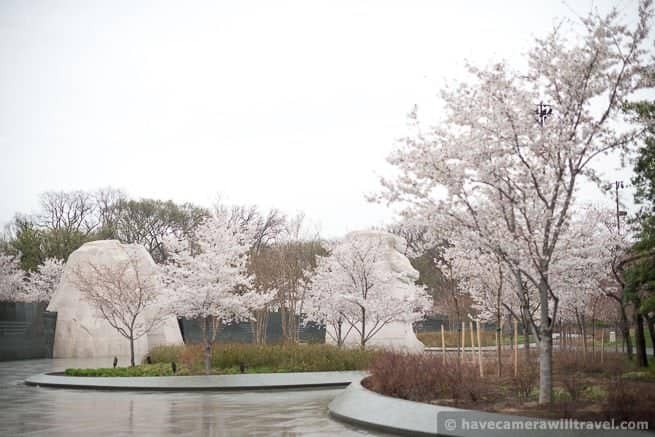 We are planning ti visit during 18th weekend, for how many days after the peak bloom does the blossoms last? It depends. You can pretty much count on them looking wonderful for 2-3 days after, but if the conditions are right you might be able to squeeze an extra day or two. 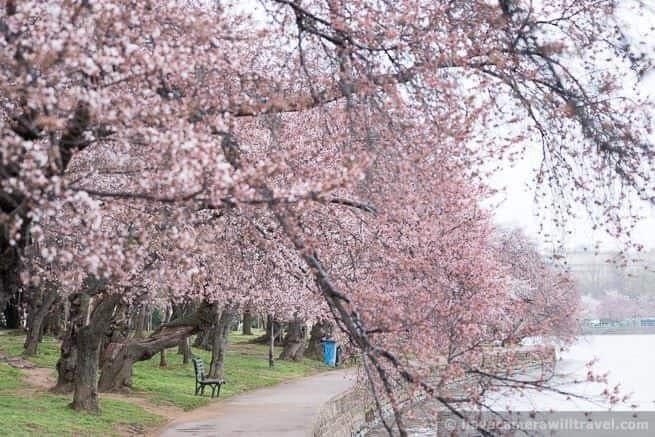 They'll fairly rapidly fall after that, so that by about 6 days after you can pretty much count on them being mostly gone (though there'll be other flowering trees, including some other varieties of cherry blossom, nearby). Cool temperatures help prolong the bloom. Violent storms, as we've had a few days after peak bloom the past couple of years, can speed things up by knocking more of the petals off. 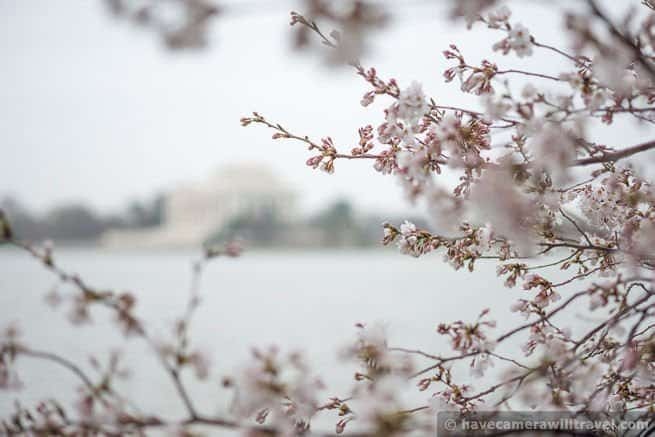 Take a look at these photos from 2012, which are marked with how many days after peak bloom they were taken. How will it be during next weekend i.e Long Weekend of Good Friday. We are visiting DC around that time. Till now i was hopeful that as the bloom is late i will get to see , now these latest updates put me in two minds if i have to hurry for this weekend or go as per plan next weekend. 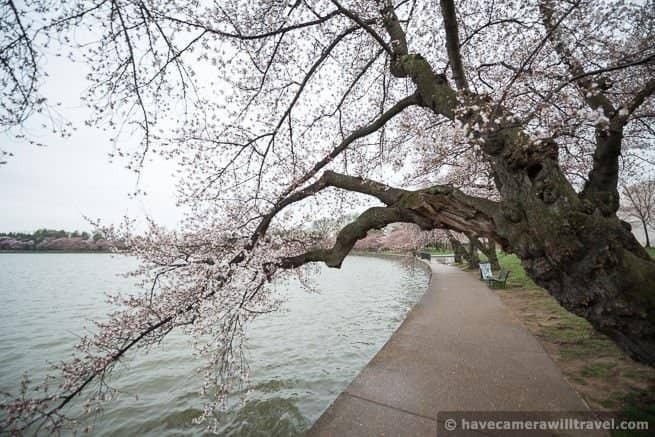 We seem to be on track for a peak bloom around April 12-13. If that holds, the blossoms will be well on their way out by the weekend of 19-20. The weekend of 12-13 is a much safer bet if it's an option. Do you think today's rain will effect the trees in any way? We're scheduled to get out there Saturday afternoon. No, it shouldn't be a problem. I'm seeing the forecast is predicting a thunderstorm Friday. Is that usually bad or does it depend on how windy it will be? 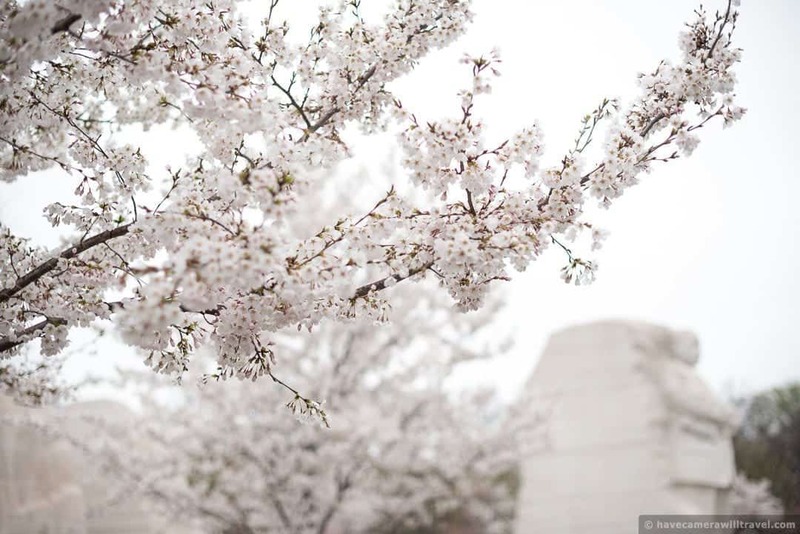 A combination of heavy rain and strong winds can knock petals off--and we've seen that happen in the past couple of years--but that tends to have more impact after the peak bloom as the blossoms are fading and the petals' grip is naturally weakening. I see. 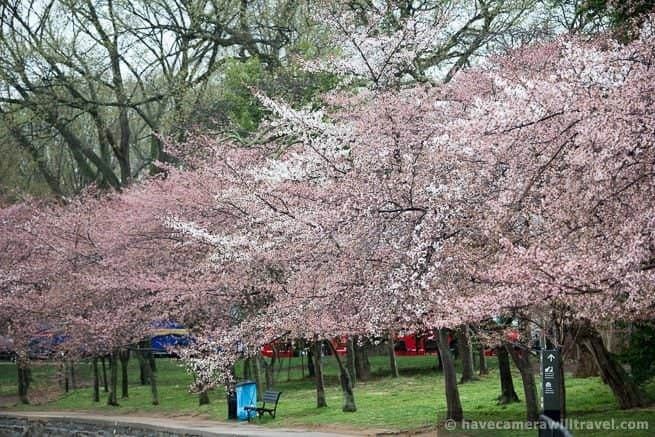 When do you personally think peak bloom will be? Both the NPS and Capital Weather Gang predictions are looking pretty good at the moment. Looks like we're on track for sometime around April 12-14. But, of course, the trees will be pretty much in full bloom for at least a couple of days before that and a couple of days after.